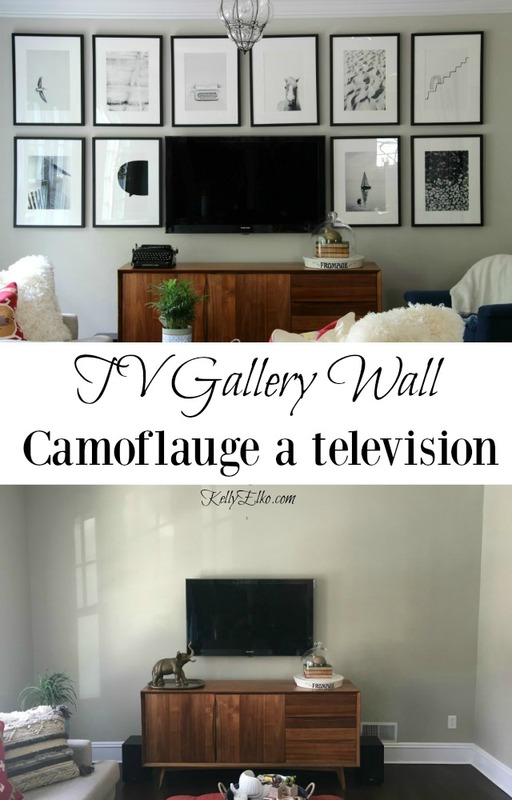 I’ve been staring at this black hole of a TV for years and have always wanted to create a gallery wall so the TV would no longer be the focal point. Indecision crippled me for a long time until I finally narrowed my choices down to these four types of gallery walls. Sorry for shouting but I can’t stop staring at this wall now. 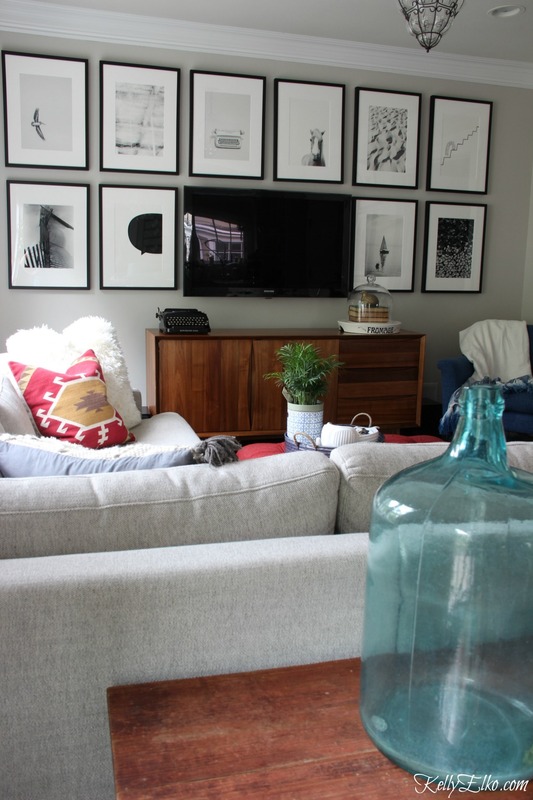 Before I hung the art, I painted the walls this warm shade of gray and I love the new color. 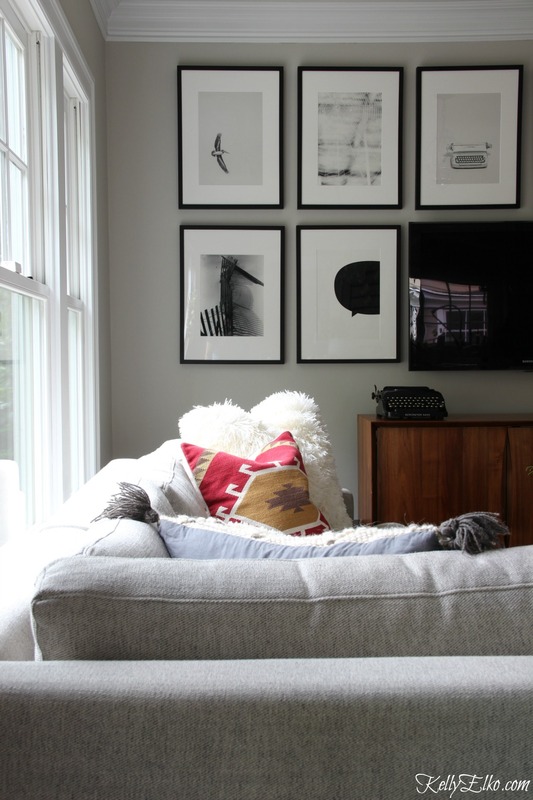 The black frames help the black TV blend into the wall instead of it sticking out like a sore thumb. 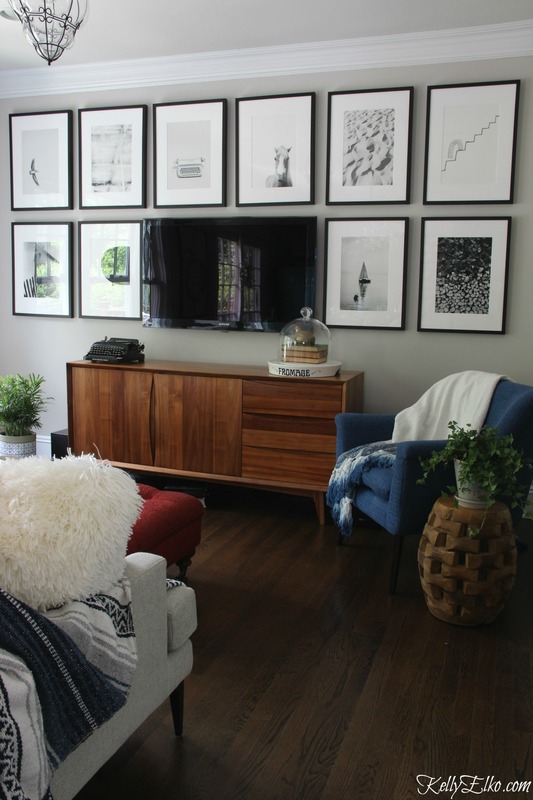 I teamed up with Minted to create this TV gallery wall grid of my dreams. 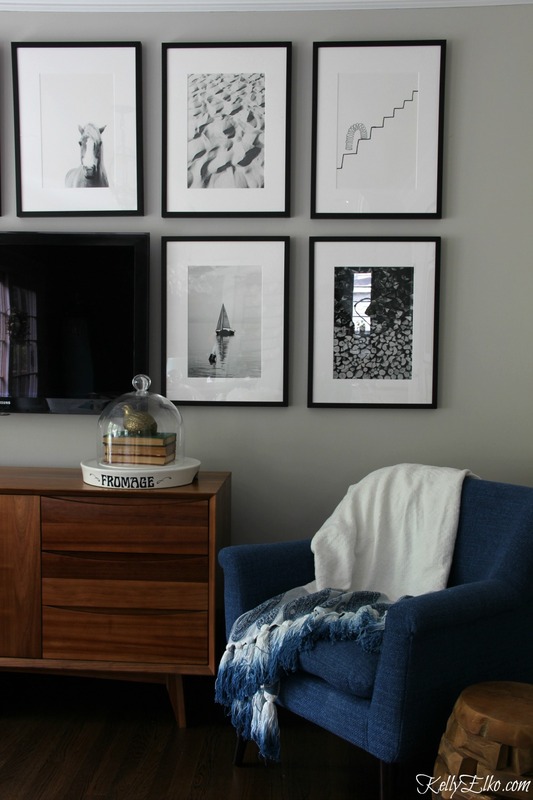 I love that you can buy unframed art on Minted or have it framed and/or matted for you. Each limited edition print comes in lots of sizes too. Little by little, I’ve been updating my small family room. First I replaced the clunky console table with this mid century beauty. Next came my comfy sectional sofa that fits my whole family (including our dog Sushi) comfortably and I recently added this petite blue chair I found at HomeGoods. 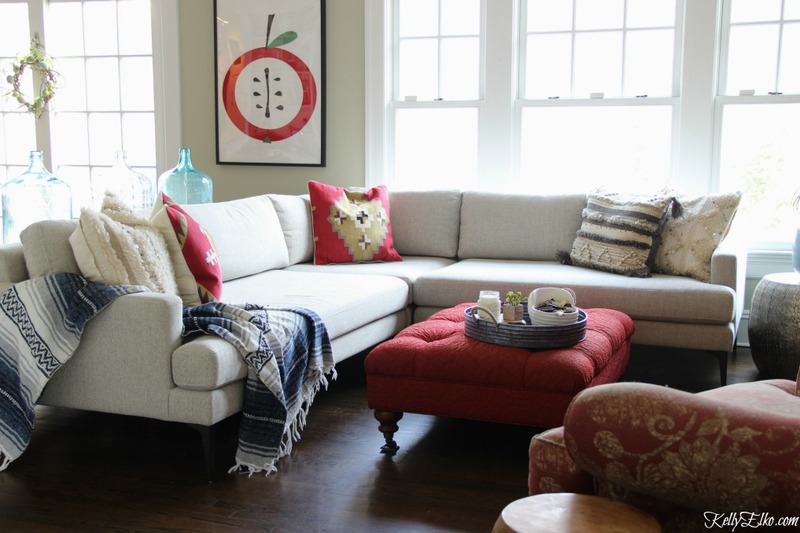 I love the big fluffy white pillows paired with a couple of red kilim pillows for color and pattern. Now my quest is on to find the perfect rug. But in the meantime, you’ll find me hear binge watching Netflix with a big bowl of buttery popcorn. I love lounging on this Sectional Sofa! It’s so comfy and fits so many people. And finally let’s check out the before and after – I love the new paint color that makes the room lighter and brighter. I had so much fun creating this focal wall and the art selection at Minted is huge which means you can really customize your space to fit your taste. I’ll be back soon to share the easiest way to hang art in a straight line without divorcing or killing your spouse. 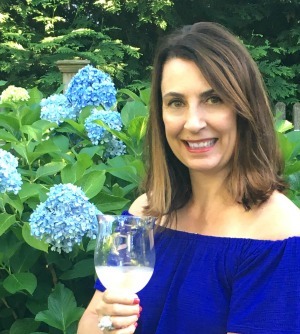 « Previous: Sale Alert – Summer Favorites (& Pineapple Pants)! Love it Kelly!!! !….Looks so amazing!!! … and the room looks fabulous too! Love that beautiful console table! Thanks Shirley – I’m loving the way the room is coming together! Awesome Heidi – I know you’ll make the new place fabulous! Love this! Very useful and fun … and pretty to look at, too! Thanks Jeryl – I really love it! I’m a mom too – I get it Deb!! I love it. It looks amazing! I really love your gallery wall. Im so gkad you went with the black and white prints. Looks so nice around the TV. And the new grey paint colors are so nice. I painted my daughter’s nursery a nice grey. Heck I would paint most of my house grey if I could. Thanks for sharing! Thanks Hope – we’ve been painting more rooms this color! Gorgeous! 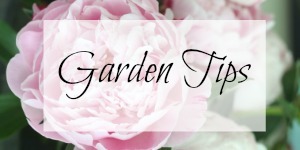 It makes such a huge difference – I love the grid style. 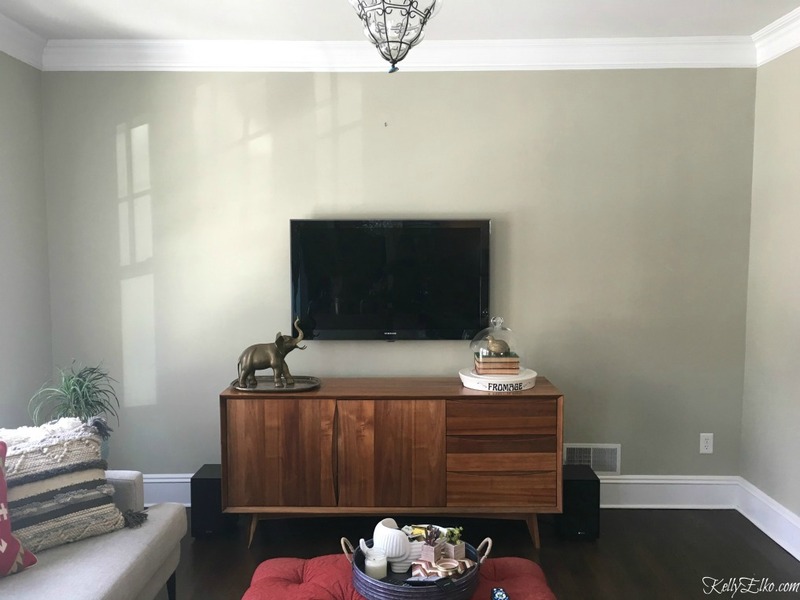 Can you please share the wall paint color? 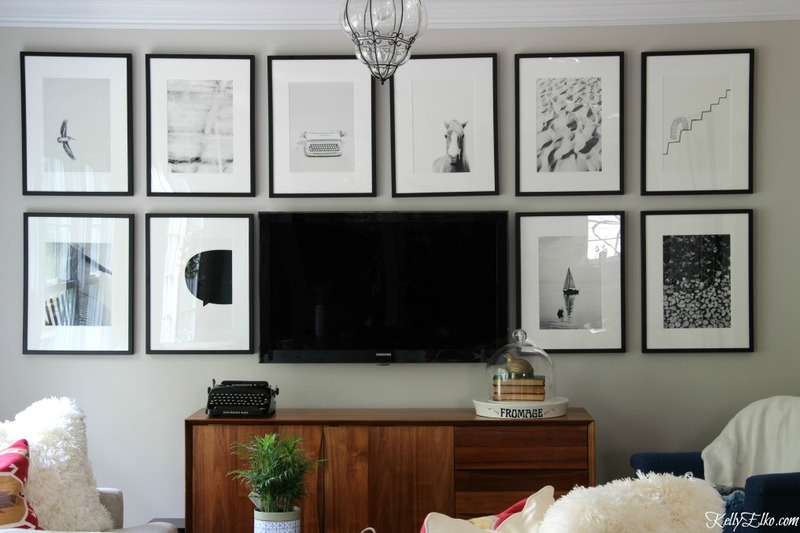 Looks beautiful with your gallery wall! Hi! Will you please tell me what size the frames are? And what size the pictures are?